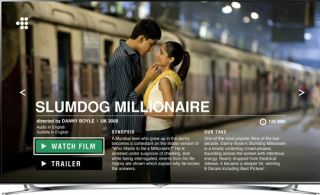 MUBI streaming film app now on Samsung Smart TVs | What Hi-Fi? Video-on-demand service MUBI is now available as an app on Samsung Smart TVs and Smart Blu-ray players. Users can watch an assortment of films which are hand-picked by MUBI editors. There are currently 30 films to choose from, but the library is updated daily. Titles so far include The Fifth Element, Oldboy and Slumdog Millionaire. Guy Kinnell, Head of TV and AV at Samsung Electronics UK & Ireland, said: "The addition of MUBI to the Samsung Smart Hub not only strengthens our film offering but provides our customers with even more variety, choice and entertainment for their viewing. "From a carefully curated collection of film classics and fan favourites, customers will be guaranteed the very best of cinema straight into the living room." Samsung Smart TV apps already include Spotify, YouTube, Facebook and Twitter, as well as a range of catch-up TV services such as BBC iPlayer.